This past week was light on monthly data. Retail sales surprisingly declined in December, but that decline was overmatched by revised increases in November. Industrial Production, Capacity Utilization, and the CPI all increased as expected. Consumer sentiment for the first part of the month was decent, and the Empire State Fed increased considerably more than expected for January. Parenthetically, the strong retail sales for November followed by relatively weak for December seem to correlate well with the surprise revision to positive job growth in November followed by a surprise weak (initial, unrevised) decline in December). This month and next month are when the "rubber meets the road" for YoY comparisons. 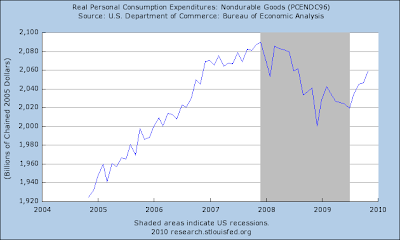 One year ago, consumers came back from the grave and started to spend a little again, rebounding from December 2008. This was my first clue that the economy's cliff-diving might be nearing a bottom. 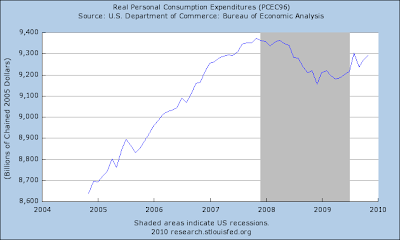 As of December 2009, we had 2.5% more real retail spending than a year before. Can the consumer continue the slow rebound? Shoppertrak did not report for the week of January 9, but the ICSC reported same store sales for the week ending January 9 down -3.0% WoW (not a surprise given the end of the holiday season) and up 1.7% YoY. This is not as decent as it seems, since inflation is up 2.7% YoY. Railfax reported that cyclical, intermodal, and total rail traffic were all higher than a year ago. Cyclical traffic, despite being at its seasonal low, was already at level equal to highest in the first half of last year, a good sign. The BLS reported 444,000 new jobless claims for the prior week, up 10,000, but the 4 week average declined to 440.000, continuing the good trend. Since the BLS may have overdone the seasonal adjustment, I expect these numbers to increase in the next few weeks to the range of 480,000, but I do not think the longer downward trend since last April will be disturbed at all. Gasoline sold for $2.75/gallon, breaking out higher from recent range. Gasoline use is in seasonal decline, but barely higher than last year. Oil ended the week at $78 a barrel. This bears watching carefully, as this is the most likel driver for any "double-dip" back into recession as the year progresses. The daily treasury statement for January 14 showed $68.9B in payroll taxes paid so far this month vs. $75.0B last year, an -8% decline. Since these payments show a lot of seasonal variance, I continue to think that last October was the actual bottom in withholding tax payments. The consumer will begin to show their hand for 2010 in the next few weeks. If you've never visited, you really ought to set aside a few days for a trip. Finally, on a personal note, in my offline life I am totally swamped, so my blogging, which I already cut back in the last few months, will suffer some more until I dig out. - Peace, NDD. 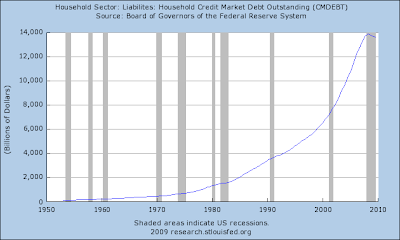 Oh my God -- Consumer Debt is Down! The Sky is Falling! OH MY GOD! Consumer debt is falling! That means the sky is falling!!!!! We're doomed!!!!! 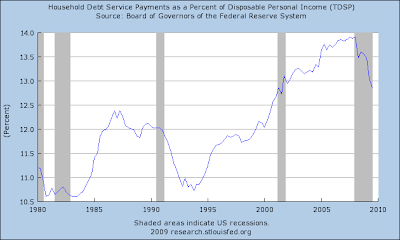 Except that now household debt service payments are also declining, giving households some financial room. In other words -- we're finally working at living within our means. That's a good thing. Industrial production increased 0.6 percent in December. The gain primarily resulted from an increase of 5.9 percent in electric and gas utilities due to unseasonably cold weather. Manufacturing production edged down 0.1 percent, while the output of mines rose 0.2 percent. The change in the overall index was revised up in October, but it was revised down in November; for the fourth quarter as a whole, total industrial production increased at an annual rate of 7.0 percent. At 100.3 percent of its 2002 average, output in December was 2.0 percent below its year-earlier level. Capacity utilization for total industry edged up to 72.0 percent in December, a rate 8.9 percentage points below its average for the period from 1972 to 2008. There's a lot of information in that paragraph, so let's take it sentence by sentence. -- Last month's gain was utility driven. -- Raw material extraction increased. -- The fourth quarter saw a large (7% AR) increase. 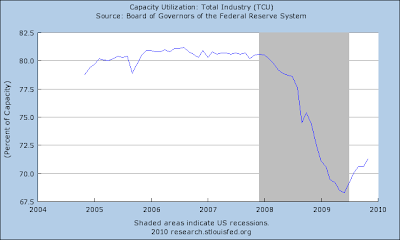 -- The total percent of US industrial capacity used for production increased again. The Empire State Manufacturing Survey indicates that conditions for New York manufacturers improved for the sixth consecutive month in January. The general business conditions index climbed 11 points, to 15.9. The new orders and shipments indexes posted similar increases, and the unfilled orders index rose above zero. Both the prices paid index and the prices received index rose significantly, with the latter moving above zero for the first time in more than a year. Employment indexes advanced into positive territory. Future indexes were highly optimistic; activity and employment were widely expected to improve over the next six months. 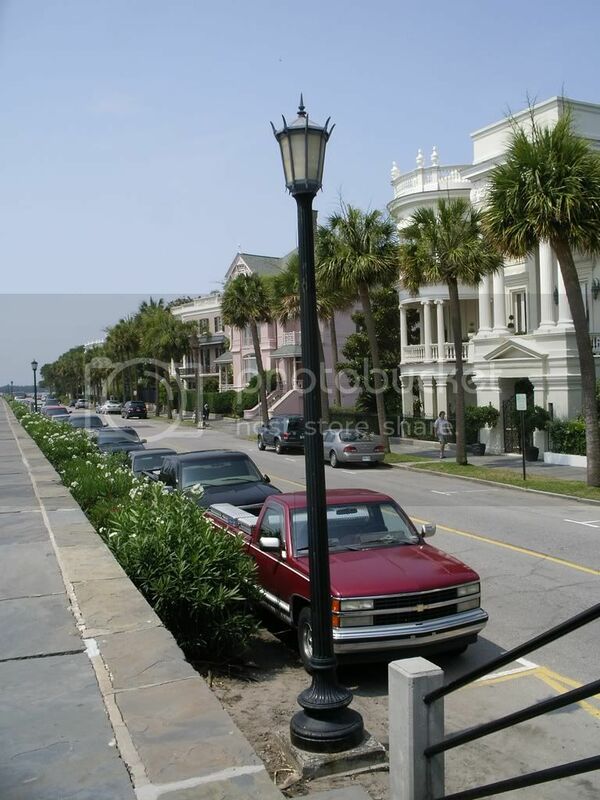 Prices, however, were expected to continue to climb in the months ahead. Over the last two months the number dropped to near 0, leading to some concern. But the numbers have rebounded indicating this region is doing well. Also note that this is the 6th straight month of positive readings; this is not a one time event but a clear trend. On a seasonally adjusted basis, the December Consumer Price Index for All Urban Consumers (CPI-U) rose 0.1 percent, the U.S. Bureau of Labor Statistics reported today. Over the last 12 months, the index increased 2.7 percent before seasonal adjustment. The month to month CPI numbers have shown continued increase since August and are up 7 of the last 8 months. While the YOY number is 2.7%, remember the comparison is to a very low December 2008 level. That means the YOY numbers for the next two months will be high. Overall, both of these numbers were very good. C.) Prices gapped lower and are consolidating below all the EMAs before their next move. A.) All of these charts have the same quality: all of them are right at expansion levels. Some are right at the level, some are just over, but all are really close. All of them need some push. Tomorrow we get CPI, industrial production, the empire state and consumer sentiment. Something's gotta give. Yesterday the Federal Reserve released the Beige Book. This is a great document for getting an overall feel for the economy. I'm going to spend the day looking at the national level numbers and supplementing the Fed's text with graphs and other relevant information. Consumer spending in the recent 2009 holiday season was modestly greater than in 2008 for eight Districts, although as retailers in the Philadelphia and San Francisco Districts noted, 2008 sales were so low compared with 2007, that the relatively small 2009 gains did not represent a significant shift in trend. Consumers were variously described as cautious, price sensitive, and focused on necessities, but sometimes willing to spend on discretionary purchases. Kansas City and New York reported holiday sales comparable to prior year sales, while Cleveland and Richmond reported weaker holiday sales in 2009 than in 2008. Entering the holiday period, retail inventories were maintained or lowered further to lean levels in the Atlanta, Boston, Chicago, Cleveland, and New York Districts. Some Chicago retailers reported running out of high-demand items during the holiday season, but inventory levels rose slightly in the Kansas City District. Auto sales were flat or up slightly for some dealers since the last Beige Book in the Atlanta, Chicago, Cleveland, and Philadelphia Districts. Dealer incentives boosted year-end inventory clearance according to Chicago District contacts. In the Dallas, Minneapolis, New York, and San Francisco Districts auto sales held steady or were mixed across states. The Kansas City and Richmond Districts reported lower auto sales since the last report. Some dealers in the Cleveland and New York Districts cited difficulties securing floor-plan financing. Difficulties securing customer financing was a concern cited by some Kansas City District dealers, while Philadelphia District dealers credited easier financing for supporting their recent sales. Early-season snowstorms gave ski resorts a big lift in the Richmond and Minneapolis Districts; otherwise travel and tourism reports were mostly flat or weak in these and other Districts. One Minnesota-based travel services firm shut down due to lack of demand, and Richmond's tourism contacts reported consumers searching for deeply discounted packages and dining out less despite special offers. The New York, Atlanta, and Kansas City Districts also reported flat or weaker tourism. New York City's Broadway theaters reported weaker attendance this past holiday season than in 2008. Atlanta reported sluggish tourism throughout their District, but expected a boost from hosting upcoming National Football League events, and from strong 2010 cruise line bookings--a result of deep discounting. Kansas City and San Francisco noted sluggish business travel, placing downward pressure on airline passenger volumes, while Dallas reported airline demand recovering and fares stabilizing. The San Francisco District reported greater visitor volumes in Hawaii and Las Vegas, while occupancy rates in Seattle and Southern California were down. 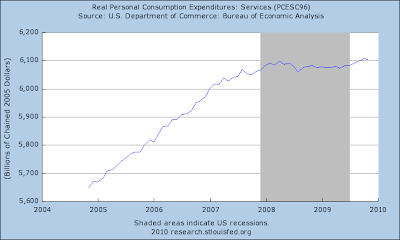 Overall real PCEs hit a floor in early 2009 at about $9.2 trillion. Since then they have risen about $100 billion. This is certainly not as must as in other years, but is an improvement nonetheless. Interestingly enough, services -- which comprise about 65% of PCEs -- have been steady since early 2008. Non-durable sales have also bottomed and increased from their bottom. The auto industry closed one of its worst years in history on a positive note, with U.S. sales rising about 15% in December and many executives predicting a gradual recovery in 2010. Ford Motor Co., Toyota Motor Co. and Honda Motor Co. all reported substantial sales increases in the year's final month. Toyota said the surge meant it sold more cars to U.S. consumers in 2009 than any other maker, passing General Motors Co. in "retail" sales for the first time. In short the overall car buying atmosphere appears to be better. 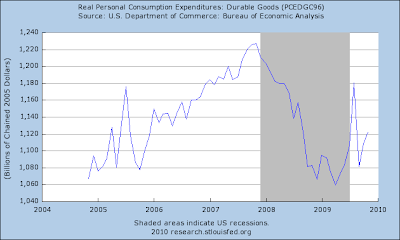 The consumer is recovering -- however, he is far from recovered. But things are definitely moving in the right direction. Districts reporting on nonfinancial services generally indicated an upward trend in activity, although in some areas reports were mixed. Boston reported widespread positive activity in advertising, consulting, private equity firms, healthcare, biotechnology, education, and government services. High-tech service firms reported favorable conditions in Kansas City. New York reported a general pickup in activity. Health care providers reported increased demand in the San Francisco District, while professional services, especially advertising and accounting weakened. The Minneapolis District also reported mixed results across sectors, while activity in the Richmond District was generally down. Hiring through staffing firms was reported up in New York, Cleveland, Chicago, and Dallas with office and health care workers in greatest demand. Direct firm hiring was reported up in the St. Louis District, flat in Dallas, flat to down in New York, and down in Richmond. Among the five Districts reporting on transportation services, activity was mostly up slightly, or mixed. Freight shipping volumes were up slightly in the Atlanta, Cleveland, and Dallas Districts, while Kansas City reported a slight slowdown in activity. The Richmond District's port activity gained from increased international trade, especially imports of high-end vehicles, but intermodal firms in the Dallas District reported that imports dropped and exports flattened producing no increase in cargo volumes. Dallas also reported continued declines in rail cargo volume. This number bottomed in the Spring but has been rising steadily since. The report includes comments that area illustrative of the overall sample. Note the top three indicate a cautiously optimistic outlook. It indicates that survey respondents are feeling a bit better -- although it is clear no one thinks we are out of the woods. Manufacturing activity has improved since the last report in six Districts. New York reported a general pickup in activity, broad optimism, and some increase in employment. Production was stable or slightly up in the Cleveland District. Firms in the Cleveland District expect greater export opportunities going forward, but steel firms expect slow growth in overall demand. Manufacturers in the Chicago District cited gains at firms tied to the auto industry and those benefiting from an increase in exports to Asia. Firms in the Boston District also cited Asian exports as well as defense work as sources of their positive demand, but identified weak demand for exports to Europe and for products related to energy sectors and commercial construction. San Francisco reported a modest net improvement in manufacturing activity, with semiconductors strengthening and aircraft and parts stabilizing at moderate levels. Metal fabricators and housing products have also stabilized, but at very low levels. Three Districts reported mixed results for manufacturing. Food products, furniture, and chemical firms reported slight increases in the Philadelphia District while other manufacturing sectors continued to decline. Dallas reported strength in high-tech and corrugated packaging, seasonal increases in food producers, little change in fabricated metals and petrochemicals, seasonal decreases in aircraft components, and weaknesses in emergency vehicles and construction-related manufacturing. The Minneapolis District reported manufacturing activity up in Minnesota, but down in the Dakotas based on a recent survey of new orders. 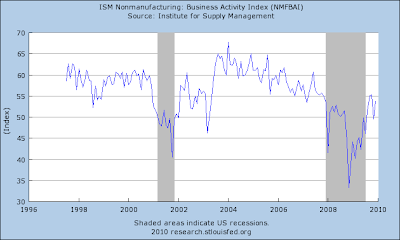 Manufacturing activity was weak in the other Districts. Richmond reported widespread weakness across shipments, new orders, and employment within its manufacturing sector and Atlanta saw orders and production drop back after an increase in November. The St. Louis District reported a continued decline in activity, persistent weakness in employment, and plant closings, on net. Manufacturers' expectations for the near future as reported from the Boston, Chicago, Cleveland, Kansas City, New York, and Philadelphia Districts were all optimistic, although Kansas City firms were less optimistic than the last report. Capital spending plans remained more cautious. Only Boston and Philadelphia reported that firms were planning to increase capital spending in the current year. Cleveland, Chicago, and Kansas City reported expectations of continued modest spending. While the overall trade deficit is again increasing, it's important to note that overall, exports have increased pretty strongly since the spring. Note the number is now back to pre-recession levels. Manufacturing is clearly on the mend. Initial jobless claims during the week ending January 6 rose slightly to 444,000. The 4 week moving average fell 9,000 to 440,750. On an unadjusted basis, there were 801,086 claims, up 156,165 from the week before, compared with 956,791 claims one year ago. This week is the "high water mark" for holiday seasonal adjustments. Beginning next week, the seasonal adjustment rapidly shrinks toward neutrality. The last couple of years, the holiday seasonal adjustment has been too optimistic, as Prof. Brad DeLong points out. So I fully expect initial jobless claims to temporarily increase towards the range of 480,000 or so in the next few weeks, more in keeping with their longer-term trend, and to gradually decrease from there. Last July and August we were told that this increase was an Omen of Doom. It was wrong then and it will be wrong now. 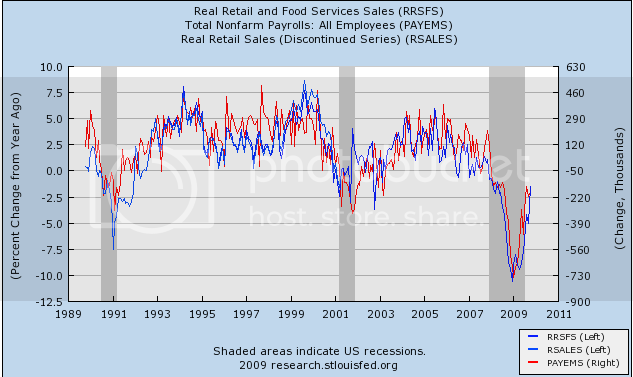 Meanwhile, retail sales very unexpectedly declined (- 0.3%) in December. Ex-autos, they decreased (-0.2%). So, very bad. But, at the same time, November's strong grain was increased even further, from +1.3% to +1.8%, and ex-autos was increased from 1.2% to 1.9%. Some of the decreases in sales last month followed gains in November, indicating problems with adjusting the data for seasonal issues may have played a role in the see-saw pattern. The mid December blizzard in parts of the eastern U.S. may also have contributed to the decrease. Auto sales fell 0.8 after a 1.2 percent November gain. Industry data showed an increase in purchases. Typically December is a good month for auto sales, so the decline was on a comparative basis. The net change for the two months is +0.2% in total, and +0.5% ex autos, so between the two months, not bad (hence the asterisk*). Now we have a surge in sales in November, and a pullback in December, and a surge and pullback in the trend in monthly payrolls as well. Pending further revisions (! ), the relationship still holds. Update: The inventory to sales ratio for November declined to 1.28 from 1.30, showing that as of that date, businesses were still keeping a very tight rein on inventory and being chary about restocking sold products. At some point presumably very soon (or already since we don't know about December) this is going to bottom, and the restocking bounce in GDP and employment is presumably going to kick in. A.) Since the end of December, prices have gapped higher on four different occasions. This is a very bullish development, as it represents a fundamental supply and demand mismatch that pulls prices higher. C.) Have since sold-off (quickly) to the 200 day EMA. Notice that like the rally, prices saw two downward gaps on the retreat. This tells us that traders took profits quickly to get out of the market ASAP. A.) The transports have broken through upside resistance, but have since fallen to support levels. A.) On decent volume, prices rebounded from support. A.) Momentum is increasing, although at a weak level. Ideally, we'd like to see the upward angle move at a sharper angle. B.) Notice that when prices were consolidating the A/D line did not fall. That tells us money did not leave the market -- a good sign. Today we will see more theater regarding Wall Street. I've been silent on this issue because so far the entire exercise has been pointless. Here's how you deal with the problem. Regarding derivatives, put them (all) on a regulated market. Personally, I would argue for the CBOE, but that's just me. Others are available and equally qualified. Regarding consumer credit issues, eliminate the really hyper-fancy loans (like option ARMs and IOs) as a product for consumers. Consumers get a choice: a 15 year mortgage or a 30 year mortgage. Simple. This isn't rocket science -- it's actually pretty straight-forward. The basic problem is both parties are represented by idiots. Back when there were calls for nationalizing all the banks I wrote several pieces arguing against it. The basic reason is this: yes the current crop of bankers are incompetent. But -- do you really want Chuck Schumer and Mitch McConnel in charge of a bank? If you think it's bad now -- wait until these idiots start to make loan decisions. So we'll see lots of grand-standing, camera hogging, and lots of terms thrown around that the speaker doesn't understand what they just said, and then nothing will be accomplished. General Motors Co. has freed up cash to fund a major update of its full-size pickups, a bet that consumers and businesses will resume buying trucks after a long lull in sales. Chairman and Chief Executive Edward E. Whitacre Jr. has agreed to fund the move, said GM product chief Tom Stephens. The remodeling could cost the company close to $1 billion, a person familiar with the matter said. GM, which had relied on full-size pickups such as the Chevrolet Silverado for a major portion of its U.S. revenue and operating profit, had put off redesigning the trucks as its finances collapsed and it underwent a government-backed bankruptcy reorganization last year. Now, unlike in the 1990s truck boom, the company plans to revitalize its pickup line at the same time it invests heavily in small, fuel-efficient cars as well as in the electric Chevrolet Volt due later this year. At this week's big Detroit auto show GM displayed its new Chevy Cruze, which it hopes will be its first strong contender in compact cars in decades. Trucks sales sagged in the past two years after gasoline spiked to $4 a gallon in 2008 and home sales -- a big driver of truck purchases by contractors and builders -- collapsed amid the recession. Yes, they have other products coming out -- but you just have to wonder what the thought process behind this move. Guys -- do you really think oil is going to stay low as the economy starts to grow? China, which for more than a year has been pushing its banks to pump out cash to offset the global downturn, abruptly reversed course Tuesday, in the clearest sign yet that Beijing has turned its attention to controlling the repercussions of that credit explosion. The People's Bank of China said it will raise the percentage of deposits that banks must keep in reserve and can't lend, a shift intended to stave off inflation and the asset bubbles that can accompany it. Economists called the central bank's move a significant, sooner-than-expected step away from the giant stimulus effort that began in late 2008. "The reserve requirement often seems to function as a leading indicator, partly because it's a good signaling point to the markets," said Mark Williams, senior China economist at Capital Economics Ltd. in London. "From that perspective, it's a turning point." Also on Tuesday, for the second time in a week, the central bank raised the yield it pays on its short-term bills. That makes the debt securities more attractive for banks to buy, a move designed to siphon cash out of the financial system. While China's early recovery underpinned the global economy, the country is facing the fallout from its success earlier than other major economies. Recent news that China overtook Germany as the world's largest exporter has sharpened calls for Beijing to lift the value of its currency, a move that would make its exports more expensive. China also faces mounting protectionist pressures. Meanwhile, Beijing's stimulus policy allowed companies to gorge on easy credit and speculate on properties and stocks -- not necessarily productive investments. Banks could find themselves facing questions about whether loans could become uncollectable. The easy lending may have also encouraged wasteful spending: The government recently said that over 106,000 officials were punished last year for misconduct, including abuse of economic-stimulus money. This is a very important development for several reasons. 1.) China has been a primary driver of the recovery. If they are slowing down their lending program it indicates there is concern the negatives of this program now outweigh the positives. 2.) China's growth has provided a floor for economic activity over the last year -- basically, so long as China was still spending money then goods would flow. While the recent moves are not fatal to this idea, they do indicate a slowdown is more and more possible. 3.) Unlike the US which has been growing at a slow rate with excess capacity, China has been growing at a strong clip. That means the possibility of inflation is higher. Hence, the need to be more vigilant now. A.) 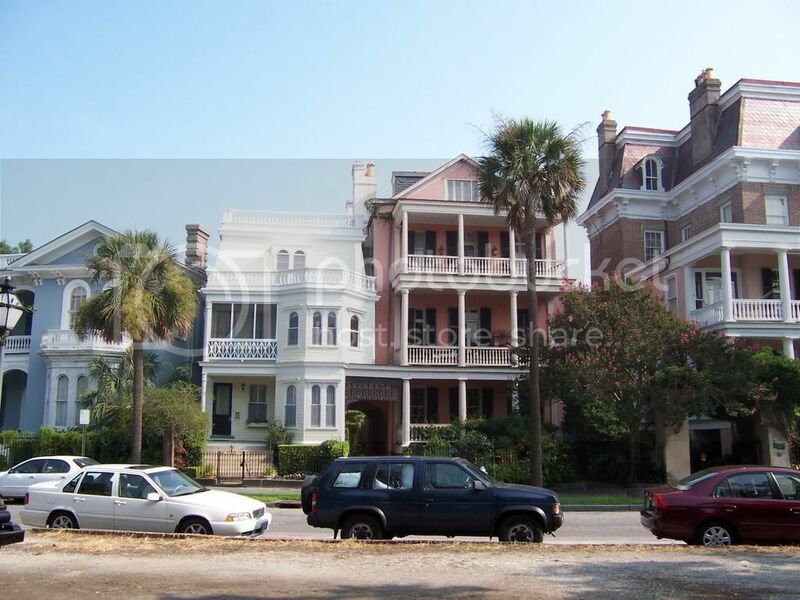 Prices have been in an uptrend for several months. B.) Prices have consolidated gains as they have moved higher. C.) Yesterday prices broke their upward trend. Trend breaks provide important information. First, we know that something has fundamentally changed in the way the traders look at a security. An uptrend trend says traders see higher prices (duh). But when that trend changes something has changed in the way traders look at that security. Now -- the question is what changed yesterday? China's surprise move Tuesday to increase the amount of funds banks need to keep on hand likely reflected its growing unease over the outlook for inflation, but analysts were divided over whether the move marks a complete change in stance for monetary policy. This means it will be harder for Chinese firms -- who are major commodities consumers -- to purchase raw materials. A.) Prices retreated to the top upward sloping trend line on higher volume. A.) Prices retreated but are still within the ascending triangle pattern. Note the 10 day EMA has curved lower, but not in a fatally bad move. A.) Prices are resting right above technical support. All of these charts have the same common pattern: prices have moved lower and are either at technical support or are contained within a pattern. The initial unemployment claims continues to drop. Also note the rate of the drop is on pace with the post 1982 recession. 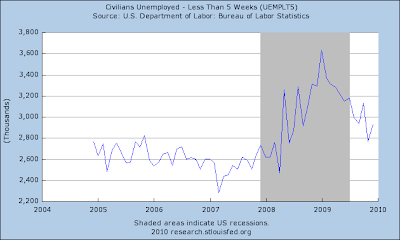 Those unemployed less than 5 weeks has been dropping since the beginning of the year. But the current level is still above the level of 2005-2007 indicating we're still above the historical norm. The number of unemployed 5-14 weeks has topped out, but is still about 1.2 million above the norm established in 2005-2007. 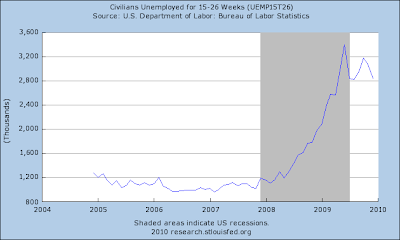 The number of unemployed 14-25 weeks also appears to have topped out, but is about 1.6 million over the norm of 2005-2008. The number of people unemployed over 27 weeks continues to increase. This number is over 4 million above the norm of 2005-2008. 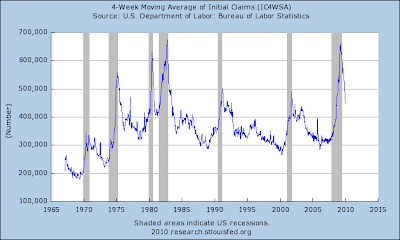 The above series of charts should be read as a time progression -- first people are laid off then the move through the various time periods until (regrettably) they are unemployed for over 27 weeks. The good news in these series is that the shorter numbers (initial unemployment claims and under 5 weeks unemployed) have been decreasing for some time. The less than 5 week number has been decreasing since the beginning of the year and the initial unemployment claims number has been decreasing since the mid/late spring. Unfortunately, because of the rate of job loss during the height of the recession there are still a ton of people unemployed. Let's revisit some numbers to illustrate that point. 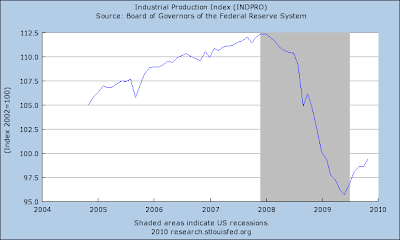 Note that at the end of 2009/early 2009 the US lost at least 600,000 jobs/month. We have also learned that the BLS added an additional ~800,000 of job losses to the total amount of jobs lost. While I am sure this will ignite another round of ill-informed conspiracy theories about employment, the reality is that measuring the economy is an incredibly difficult task -- especially during a massive financial shock. As a result, revisions are to be expected. Manufacturing jobs have dropped by over 4 million. That means the vast majority of job losses are attributable to two areas of the economy. What makes both of these areas of jobs losses concerning is this: the vast majority of these jobs probably aren't coming back. Construction benefited from the housing bubble. Considering the high rate of vacancies and existing home inventory there is no reason to start building en mass again. 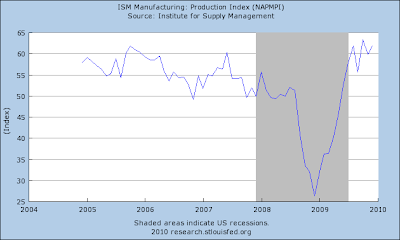 And note that after the 2001 recession manufacturing didn't come back either. The primary reason is technological advances -- the country saw an increase in overall production and productivity on a declining labor force. So -- let's sum up. 1.) The employment numbers continue to move in the right direction. Initial unemployment claims continue to drop, leading to a continuing drop in the 5 week and under category. The other categories of time unemployed have topped out save the 27 weeks plus category. 2.) A large percentage of job losses come from construction and goods production industries. 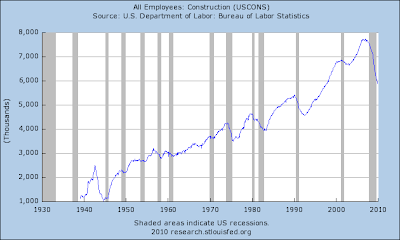 Construction jobs aren't coming back because they were caused by the housing bubble. Manufacturing jobs will probably suffer from the same circumstances that hit them in the 2001 expansion -- increased productivity leading to increased production at the expense of a declining workforce. Ages 16-19 have a 27.1% unemployment rate while those aged 20-24 have an unemployment rate of 15.6%. Let's think about those numbers for a minute. Teens are unemployed in high numbers. While that is not good, it's also important to remember this point: these are people who should be in school -- that is, being a student is their primary job. Is a high unemployment rate for this group fatal? I am more concerned about the 20-24 year unemployment rate because there is a large population of people who I am assuming need some work in college. But again, this is an age when the primary job (at least through age ~22-23) is education rather than employment. The unemployment rate for 25-34 is 10.2%. Simply put, that is a terrible number. The unemployment rate for 35-44 is 8.8%, the unemployment rate for 45-54 is 7.9% and the rate of 55%+ is 7.1%. I'm beginning to wonder if the numbers for each group over 35 is what a new structural unemployment will look like? That is -- are we moving into a period when higher unemployment rates are standard? Most of us have gotten use to the idea that 5% is "full employment". But is that level even possible or realistic right now? The downturn that started in December 2007 delivered a body blow to U.S. workers. In two years, the economy shed 7.2 million jobs, pushing the jobless rate from 5% to 10%, according to the Labor Department. The severity of the recession is reshaping the labor market. Some lost jobs will come back. 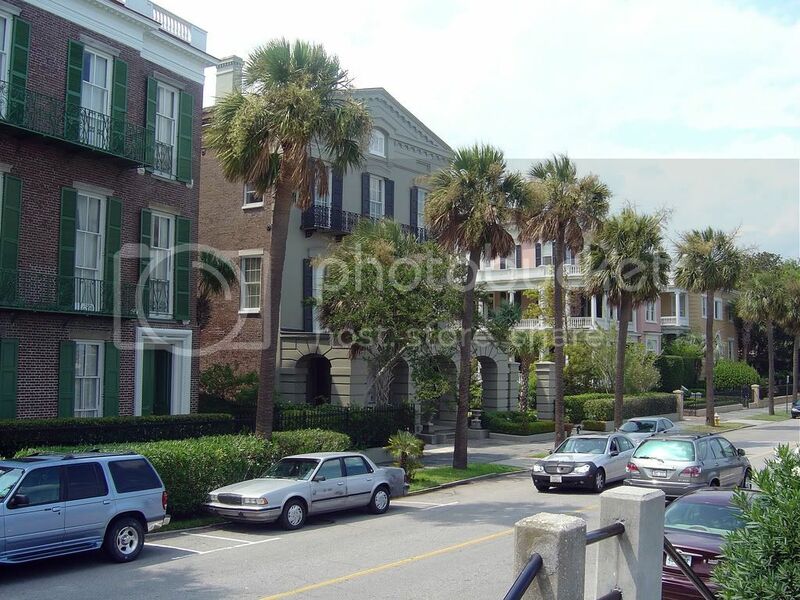 But some are gone forever, going the way of typewriter repairmen and streetcar operators. Many of the jobs created by the booms in the housing and credit markets, for example, have likely been permanently erased by the subsequent bust. "The tremendous amount of economic activity associated with housing, I can't see that coming back," says Harvard University economist Lawrence Katz. "That was a very unhealthy part of the economy." A.) Prices peaked a bit above 91 in late November. Since then they have been dropping steadily. C.) Prices are currently consolidating in a triangle pattern which can be a reversal or continually patter. Also note that prices are right against the downward sloping trend line that starts from the late-November peak. D.) Prices are bearishly aligned -- all are moving lower and the shorter and below the larger. Also note that the 10 day EMA has provided resistance for prices for the last few days. A.) Prices opened higher but quickly fell to the 10 and 20 minutes EMAs. B.) Prices found twice support twice at the previous day's high. C.) At the end of the session, prices rose just beyond the 61.8% Fibonacci number, then fell to the 10 minute EMA. 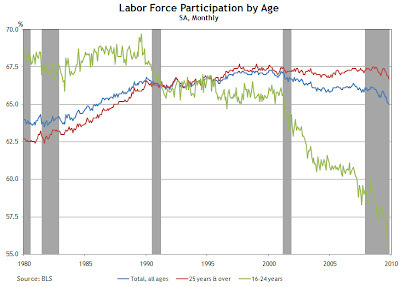 Is the Drop in the Not In the Labor Force Number Really the Beginning of the Baby Boomer Rertirement Wave? 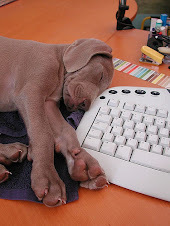 Silver Oz has posted a very thought-provoking piece on the "not in the workforce" issue currently embroiling some in the economic blogsphere. I'm going to add onto that with an explanation of what "not in the labor force" means. This will lead to two conclusions. First, many people don't know what the statistics mean. Secondly , is also appears that a large number of people are choosing to leave the workforce, indicating we are possibly witnessing the beginning of the baby boomer retirements. Labor force measures are based on the civilian noninstitutional population 16 years old and over. Excluded are persons under 16 years of age, all persons confined to institutions such as nursing homes and prisons, and persons on active duty in the Armed Forces. As mentioned previously, the labor force is made up of the employed and the unemployed. The remainder—those who have no job and are not looking for one—are counted as "not in the labor force." Many who are not in the labor force are going to school or are retired. 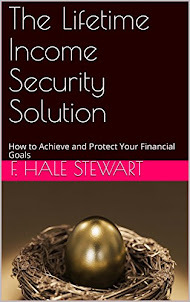 Family responsibilities keep others out of the labor force. Now, take out your calculator for a minute. 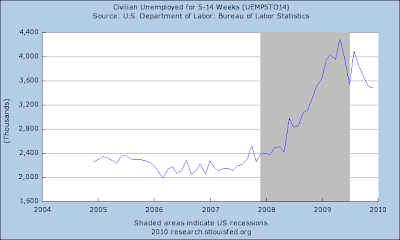 Note that civilian labor force = the total number of employed and unemployed. Then notice that the civilian labor force and the not in the labor force = the civilian non-institutional population. 1. Do you currently want a job, either full or part time? 2. What is the main reason you were not looking for work during the LAST 4 WEEKS? 3. Did you look for work at any time during the last 12 months? 4. LAST WEEK, could you have started a job if one had been offered? Additional questions about persons not in the labor force are asked during each household's last month of its 4-month tenure in the sample rotation pattern. These questions are designed to collect information about why these people left their previous jobs, when they last worked at a job or business, and whether they intend to look for work in the near future. Now -- let's do some basic math. In December the seasonally adjusted "not in the labor force" number was 83,865,000 while the "persons who currently want a job" were 6,306,000 or about 7.5% of the "not in the labor force number." This percentage was 6.8% a year ago. So the number has increased, but is still an incredibly small percentage of the "not in the labor force number." In other words, the "not in the labor force" number is composed primarily (as in over 90%) of people who don't want to work. What this means is that last month people did not disappear into some statistical black hole -- they in fact decided to leave the work force. And we know this because 7.5% of the people who "aren't in the work force" want a job. Also remember the definition above of "not in the work force:"
Many who are not in the labor force are going to school or are retired. Family responsibilities keep others out of the labor force. So -- some people have decided to go back to school -- which is a good thing. And some people have decided to retire -- also a good thing. And some have decided to help with their family -- also a good thing. Now -- go back to table A-1. From November to December, the "not in the labor force" number increased 843,000. However, over the same time period the "Persons who currently want a job" -- a subset of the "not in the labor force" statistic -- only increased by 263,000. That means 580,000 left the work force but don't want a job. From the definition above, these people could have retired, gone back to school or helped out with family matters. But the point is that about 68% of the people who left the work force last month don't want a job. Again note there is no conspiracy to send people in a giant meat grinder a la Pink Floyd. People made a decision to leave the work force. Remember that the US employment population is broken down into various subsets. The biggest group is the civilian non-institutional population -- which is the practically everybody in the country over 16 YO. 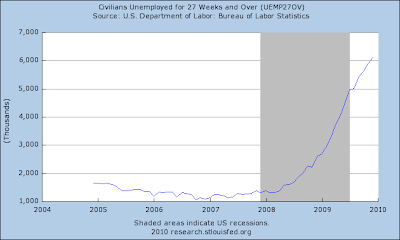 Then there is the civilian labor force which is all the people who are employed + all the people who are unemployed. To get the labor force participation rate we divide the civilian labor force (all employed and unemployed people) by the total number of people who could be working (the civilian non-institutional population). Notice that this number started to steadily increase from about 60% in the early 1970s to 66%-67% in the early 1990s. Then the number leveled off. Now we are seeing that number decrease. Also note we are just starting to see the beginning of the baby boomer retirements. That means that since the early 1970s we have seen the expansion of the number of people who were working (the baby boomers going to work) and now we are seeing the beginning of the baby boomer's retirement. The chart above is the employment to population ratio. Remember the groups from Table A1? This is the total number of employed people divided by the civilian non-institutional population. Here's what is interesting about this chart. There are two areas -- the first from 1945 to 1975 and the second from 1990 to 2010. In the first section the employment/population ration fluctuated between 55% and 58%. In the second area we see the numbers fluctuate between 61% - 64%. In other words, the US economy has gotten used to a larger percentage of the population working. But -- as the baby boomers retire that number will probably drop down. Finally, notice that the chart is approaching the percentages we saw before the baby boomers entered the work force. 1.) 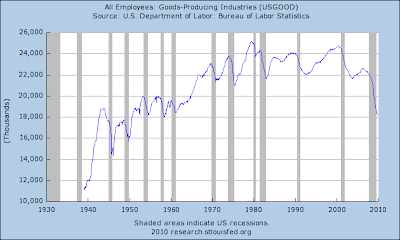 People have not "disappeared from the labor force." In fact, a proper reading of the statistics (and what they mean and measure) indicates a large number of people have voluntarily left the labor force. 2.) 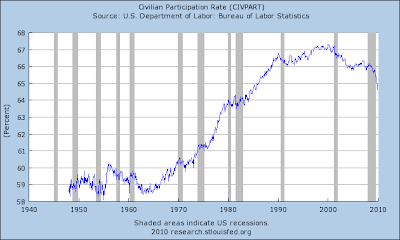 The participation rate -- the percentage of employed and unemployed people relative to almost the total US population -- began increasing in the 1970s and has recently started to decrease. This corresponds with the baby boomers entering the workforce and the beginning of the baby boomer's retirement. 3.) The percentage of the population that is working is also decreasing. But that might also be due to the beginning of the baby boomer's retirement. Is Labor Force Shrinkage Really Bad? Much has been made about last months .3% drop in the Labor Participation rate and the 843,000 additional people added to those "not in the labor force". 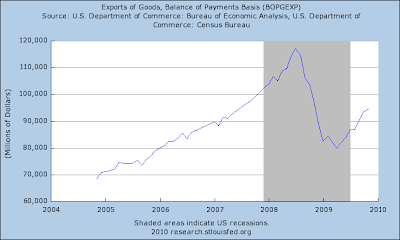 The assumption is that this is bad for our economy and yet another sign of the continued economic doom that is upon us. I believe that the drop in the labor force may not be entirely bad and much of it may be a readjustment to our modern economy/reality than something we are going to have to make up once the economic recovery gains steam (whenever that is). Agency statistics show that 2.57 million people requested benefits, up from the 2.10 million applications received during the previous 12 months. That’s an increase of 465,000, or 47 percent higher than the expected rise. Just as the boomers (and women) entering the workforce increased the participation rate from the 70's to the 90's, it is quite likely (and expected) that the boomers retiring will also cause the participation rate to decline sharply going forward. So, what we have going on here appears to be a mass (forced) early retirement exodus that is going on in the US that also coincides with the beginning of the much anticipated baby boomer exodus from the work place. This trend is something that is likely to continue even after the economy recovers, which in theory should a)potentially enable faster reductions in the unemployment rate once job growth begins and b)blunt the impact of future efficiency gains, as retirements may be able to cover job losses. Just to conclude, what we have here is not some conspiracy theory of people "vanishing" from the labor force, but a large move to early retirement by boomers (albeit pressured by the recession). A.) The really big moves for the SPYs last week came pretty quickly -- from Thursday's close to about 10AM in Monday. During this time prices moved about 2 points. In other words, the new year started with a bang. Trend lines B and C contained the price action for most of the week. Bust notice the price action was higher. D.) Prices used the 200 minute EMA as technical support for the entire week. A.) Like the SPYs, the IWMs had a big move higher from Friday's close to about 10 AM on Monday. After that move, prices were contained between two trend lines. However, unlike the SPYs these containment lines were horizontal rather than upward sloping. As a result, the IWMs were somewhat stagnant for most of the week. D.) Prices did move higher at the end of trading on Friday, as they broke through upside resistance.